When Syn Martinez walked into the arena, he didn’t notice the stares. As a 6-foot-2 tattooed black man who often wears T-shirts emblazoned with the words “Afro Brutality,” a guy gets accustomed to things. Beside him was Sarah Grey, an athlete at Martinez’s affiliate, CrossFit Harlem. She’s a 5-foot-7 native of Sweden who is heavily tattooed, and she was there to row. 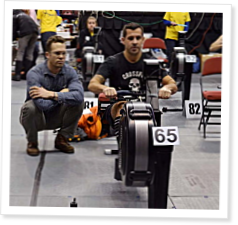 It was the 2011 CRASH-B World Indoor Rowing Championship in Boston, Mass. And while rowing might be described as brutal, it most certainly isn’t described as urban or gritty. Instead, its stigma oozes of Ivy League institutions and rich folk. Martinez and Grey symbolized change, with CrossFit athletes increasingly becoming involved in the CRASH-B competition and the sport of rowing.